Whenever heavy rainy seasons would set in, the Kyenjojo-Kagadi road would become impassable, because of the floods at Kamagadi swamp, due to the poor drainage system and lack of culverts along the road. Motorists from the Kagadi side would not cross over to Kyenjojo. Lucky travelers would pay well built men to carry them accross to other side of the road. However, this situation now seems to be addressed. 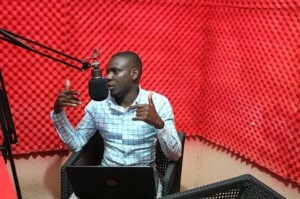 While conducting a radio talk show on Unique FM in Kyenjojo district on the 17/9/2018 about leadership and accountability with a key focus on the participation of the citizens to hold both the elected leaders and the technocrats accountable for the resources they hold in trust of the citizens, a team from the KRC Civic Education Project, highlighted the plight of the travelers on the road and received overwhelming response from the residents. that continues engagement between the leaders and the citizens through physical interactions, phone calls and writing of both the issues paper and the petitions The district leadership also listened to the show and swung into actions, within three days temporary measures we put in place –as they await the permanent solution from UNRA who are already working on the Kigumba-Kyenjojo road.